Operation Safety 91 visited Chilton County High School (CCHS) in Clanton, AL today for an Assembly with Faculty and approximately 800 students. 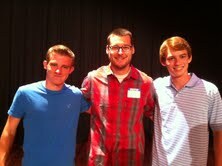 This Assembly was held by the Christian Youth Group, "Youth Alive", in CCHS. We sincerely thank Principal Mr. Greg DeJarnett, who was so very gracious in welcoming OS91 through Mason, Vice President of "Youth Alive". 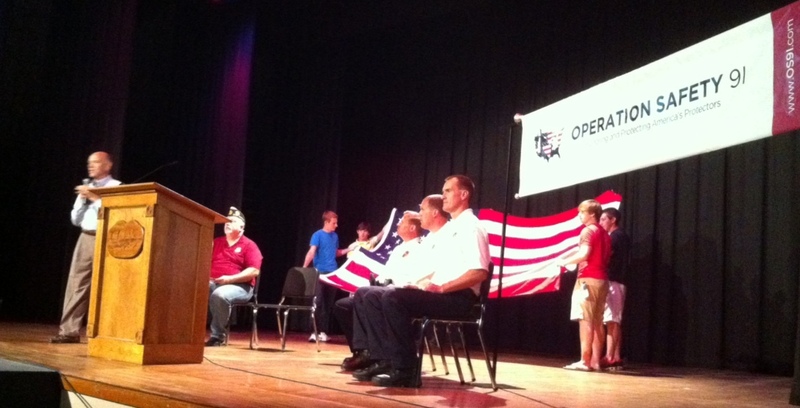 At 10:50 a.m. students and Faculty began coming into the auditorium while patriotic music played. Everyone was handed a U.S. Flag. Then at 11:00, Ed Ganster, Founder of Operation Safety 91, along with Clanton Police Chief Brian Stilwell, Clanton Fire Chief David Driver with his Lieutenant, and the National Commander of the U.S. 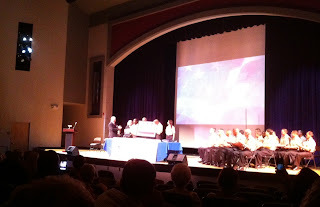 Corps of Chaplains, Commander Phil Burnette, alumnus of CCHS (1984) processed to the stage. 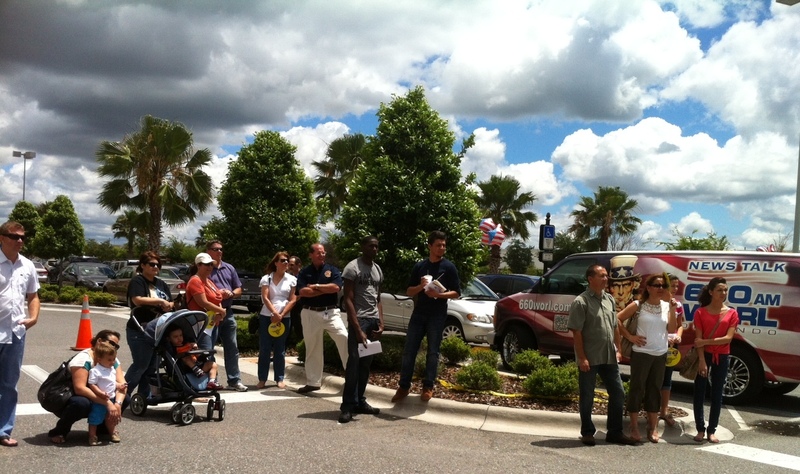 Next the prelaunch video of "Catch The Cause" was debuted on the 2 giant screens and applause erupted as it ended! Then, as a salute to America, OS91's giant 8' x 12 ' U.S. Flag was opened and held by six members of "Youth Alive", as the entire student body waved their hand held Flags for the playing of "Stars and Stripes Forever". At this point, "Catch The Cause", our new campaign to take Operation Safety 91's mission "to honor and protect Responders" across America through interactive community events, education, and social networking was introduced for the first time in a High School. Of course, as well expected, CCHS students are BIG on social networking, and patriotism is a way of life here in Clanton. So Ed issued a challenge to the students: to participate in "Catch The Cause" not only by social networking but also by contributing minimal annual dues: which for them would be $5.91 a year. 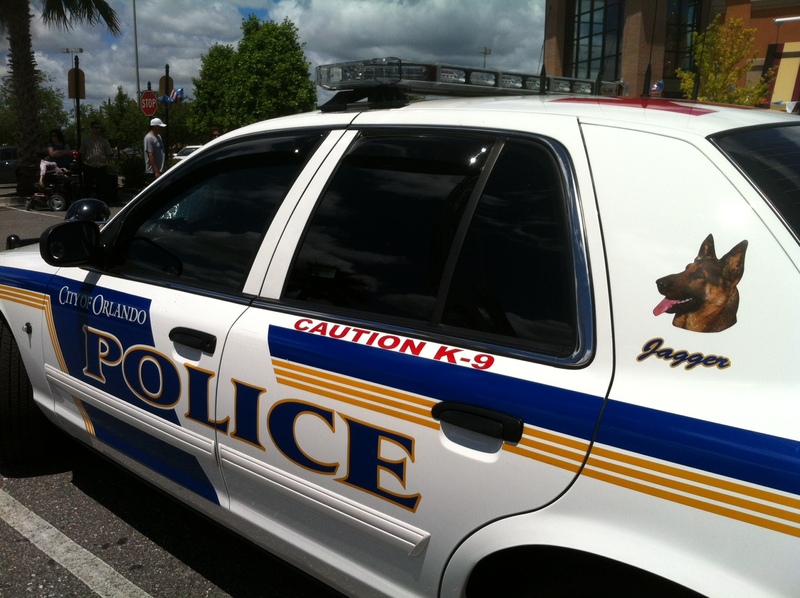 And to add an incentive, whichever Homeroom has the largest percentage of sign ups of students in addition to their adult family members (19 years +) at $9.91, younger brothers and sisters (1-11 years) at $1.91 and pet dogs at $2.91 (to support Responder K9's), that Homeroom will be rewarded with a Doughnut Party during their Homeroom time on Thursday, sponsored by OS91!!! YAY! 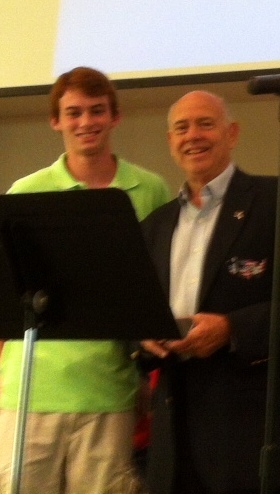 Mason, Student Vice President of "Youth Alive" wrapped up the Assembly and Mr. DeJarnett joined Mason, Ed, and the Responders on stage, commending Mason for all that he did to make all this Assembly happen. After Assembly and clean up we joined cafeteria staff, sharing testimonies and Psalm 91 books and cards. It was very special! It didn't end there and we are now back here in Clanton where we had the honor of being welcomed into Mason's Church, First Baptist of Clanton, http://www.clantonfirstbaptist.org/ where Ed preached at the Service and introduced the congregation to Operation Safety 91. We were warmly welcomed by Brother Josh, Youth Ministry Leader, who plays guitar with the Youth Choir during the Service. After a beautiful time of worship led by the Youth, Mason did a wonderful job of introducing Ed, sharing with the Congregation how we met last July, and then brought him up to speak. Sharing a bit of our history, Ed introduced the Congregation to Operation Safety 91 and its mission to honor and protect America's Protectors and then preached on Romans 13: 4-7, where Responders, particularly Police and Military, are called "Ministers of God" three times. Ed urged the people to thank Responders for their service, for they risk they assume to protect, rescue and defend us. Ed and Mary both shared some testimonies of the miraculous protection of Psalm 91 and Mary led the Congregation praying Psalm 91 from the card they each received. 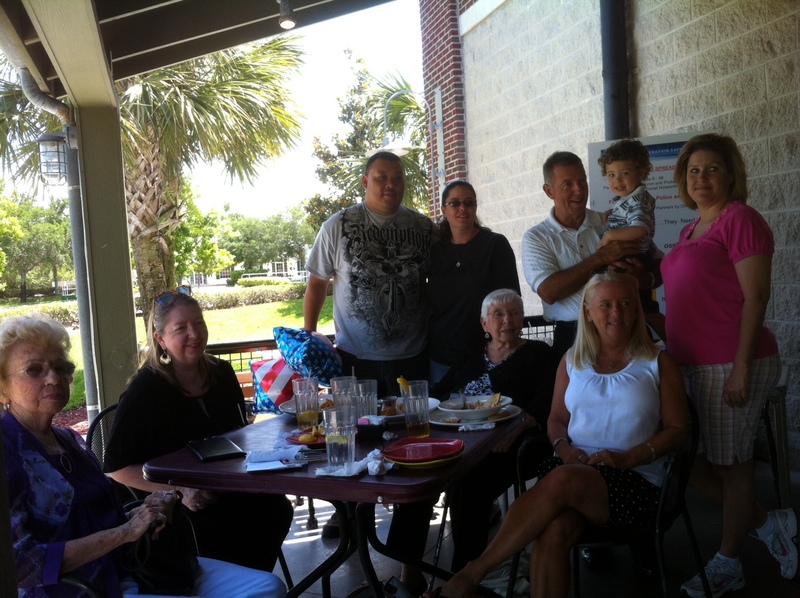 We finally had to joy to meet Mason's mother and younger brother, who attended the service. Stay tuned for more tomorrow as we visit Mason's school: Chilton County High School and do a presentation there at a school Assembly. "What One Youth Can Do" will have several more posts! 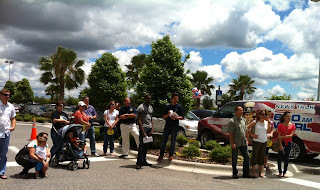 What a wonderful Event yesterday: OS91's Prelaunch of "Catch The Cause" at UNO Chicago Grill in Winter Garden! Above you are looking at a section of the parking lot in front of UNO's which was blocked of for Emergency vehicles and where people are beginning to gather for this patriotic Event. OS91 friend, Todd Nichols, who has played Bagpipes for us at all four Annual Tribute Events begins the CTC Launch beautifully and promptly at 1:00 pm. 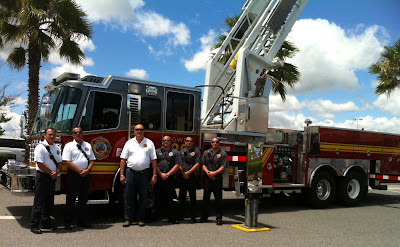 Winter Garden Fire Chief and Crew with Tower Truck extended 100 ft! People came from all over as they saw the elevated ladder of Tower Truck 22, fascinating to young and old! Chief Williamson, supporter of OS91 since its inception, spoke a great message, telling the hearers a little about the history of OS91 and our Annual Tribute Events. Orlando Police Department Sr. Chaplain Andrew Wade followed Chief Williamson and spoke about what Responder Chaplains do, much of which the public does not know. 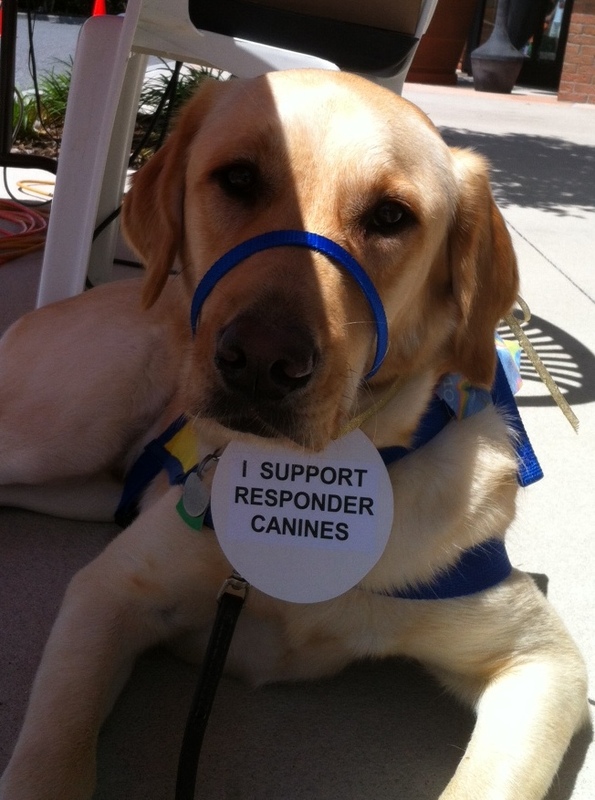 Thank you to OS91 friend Connie, trainer for Canine Companions For Independence www.cci.org for bringing "Boz" who is an assistance dog in training for CCI and who has a great future! 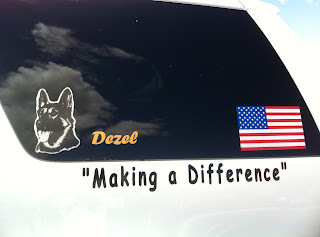 Canine Companions For Independence trains up dogs to assist our brave Military returning home permanently disabled as well as others needing assistance. Please contact CCI if you need this kind of help or to volunteer your services. 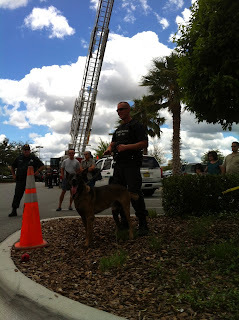 In January, when Ed and I were at Fire Rescue East, we were blessed to be assigned a Vendor spot right next to Hector. Hector became our very first CTC partner way before the prelaunch and signed up his wife and daughters with a very generous donation. These two dear young partners are following in their father's steps. They saved up some money to bring to this Event to donate to OS91 to help reach Responders with the message of Psalm 91! Hector, you and your family are a true blessing and encouragement to us. Thank you! 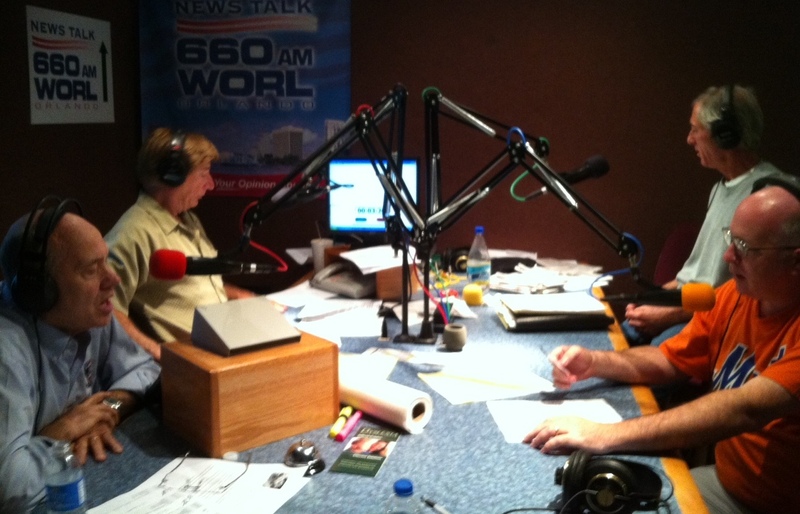 A heartfelt Thank you to Lar Adams, Christopher Hart and Dennis McCarthy for their most gracious invitation to be on the "American Adversaries" Radio show this past Sunday, 4/15. 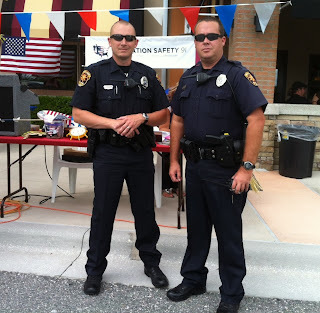 These patriots opened their arms to us to talk about Operation Safety 91's new campaign called "Catch The Cause" and the Responder Event we are having this coming Sunday 4/22 from 1 - 2 pm at the UNO Chicago Grill, 3167 Daniels Road in Winter Garden, FL. 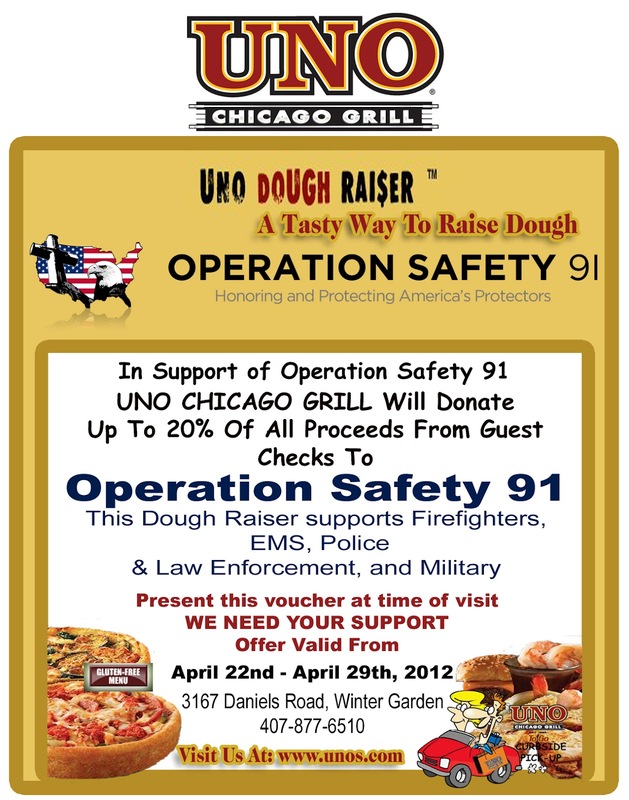 Plus it gave us advertising for the Doughraiser we are doing in partnership with the Winter Garden UNO's from 4/22 - 4/29. 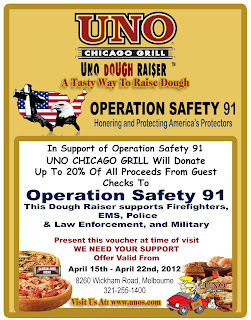 Present the voucher below for dine-in, carry-out or commercial delivery and UNO's will give OS91 20% of the check to support and expand our outreach to Responders across America as well as our Troops in Afghanistan and elsewhere around the world. Ed has been invited to speak again tonight between 5 - 6 pm. OS91 prays God's favor and blessing on these three men as they broadcast their patriotic message in the airwaves of Central Florida. They are not ashamed to say the Name of Jesus and even to pray Psalm 91 on the air as pictured above. and use it for a good cause and good food! 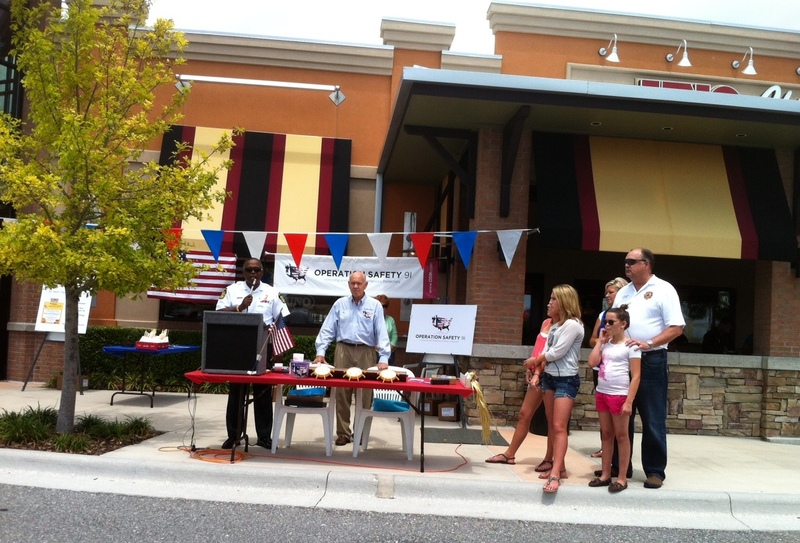 Wonderful Event yesterday, 4/15/12, at UNO Chicago Grill of Melbourne, FL, prelaunching OS91's new campaign, "Catch The Cause" plus our week long Doughraiser at this location. And our heartfelt thanks to UNO Manager, Eddie Kerr and Marketing Director Susie Parente. 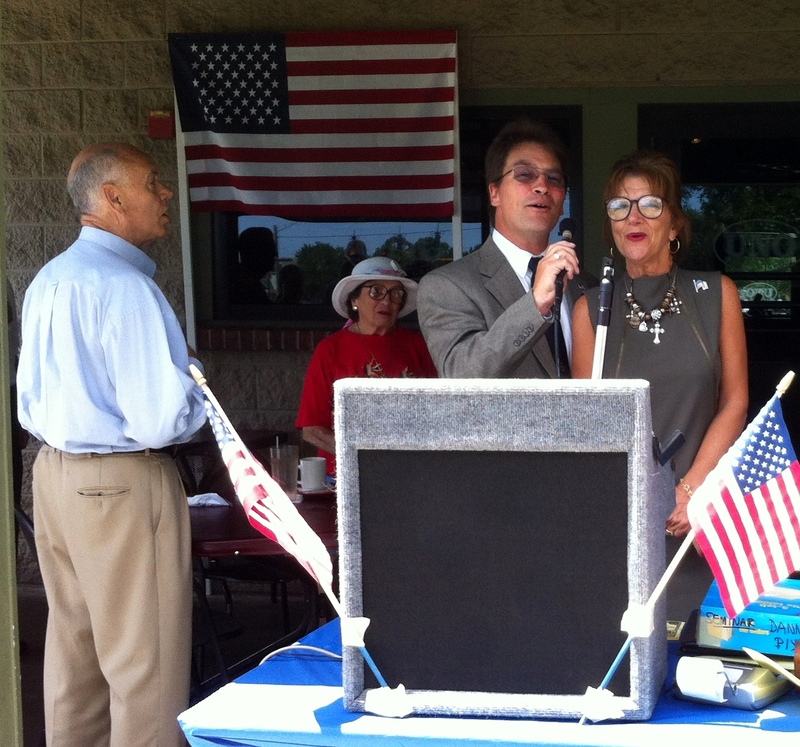 Thank you to Jeff and Patti Warner for their beautiful rendition of the National Anthem to begin the Event, followed by Ed Ganster speaking about Responders and the risk they assume to protect, rescue and defend us. 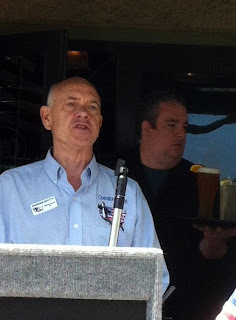 Ed then introduced our National Spokesperson, COL Danny McKnight, USA (Ret.) 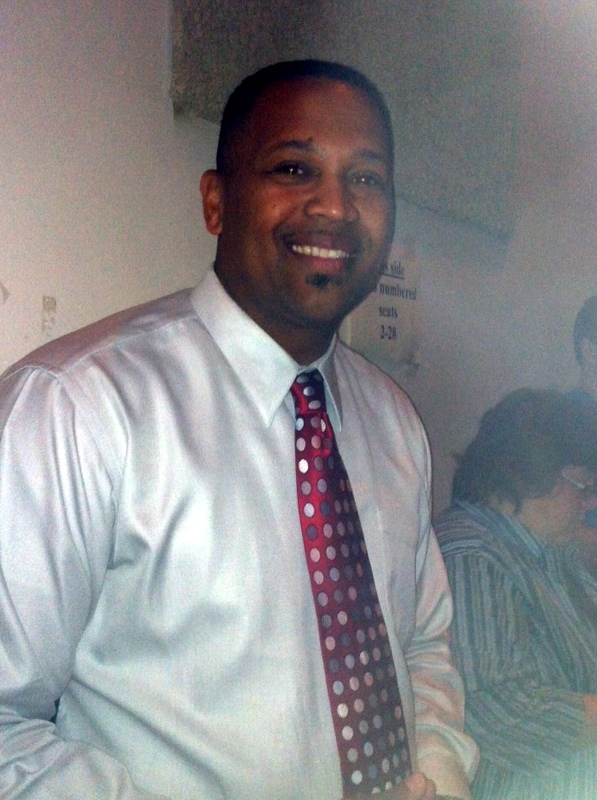 who graciously spoke for OS91 at this Event. COL McKnight introduced his grandson! After the Event was over, COl McKnight pulled us over and said, "I have something to give you!...not as your National Spokesperson, but to Ed and Mary...from Danny and Linda." Then COL presented us with a print by Dr. Guy Harvey www.guyharveyart.com/Military.html which we will proudly display in our home. 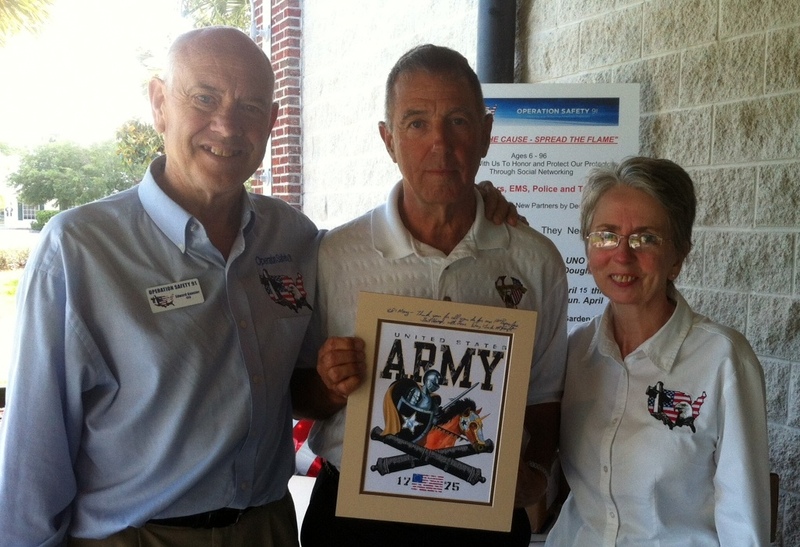 COL Danny autographed it: "Ed & Mary - Thank you for all you do for our 1st Responders. Best always, with Love. Danny & Linda McKnight". But, dear COL McKnight, let us have the last word: We are truly honored and will be forever grateful to have you as our National Spokesperson. Thank you for representing us wherever you go and distributing Psalm 91 cards to our Responders all over the world. 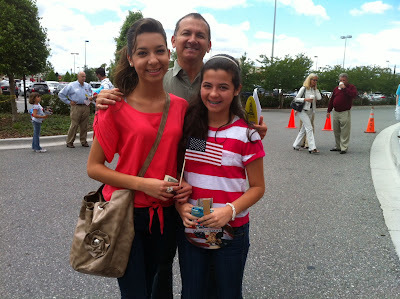 We love you and thank God for you!" Our most sincere thanks to Brevard County Sheriff Jack Parker for providing two outstanding men and a wonderful K9, to Rockledge Police Chief Ron Krueger for honoring us with his presence and bringing his wife as well as providing a K-9 and Handler! To Brevard County Fire Rescue for sending Station 47 Firefighters, as well as all Responders who came on their day off and for all who came to support OS91! 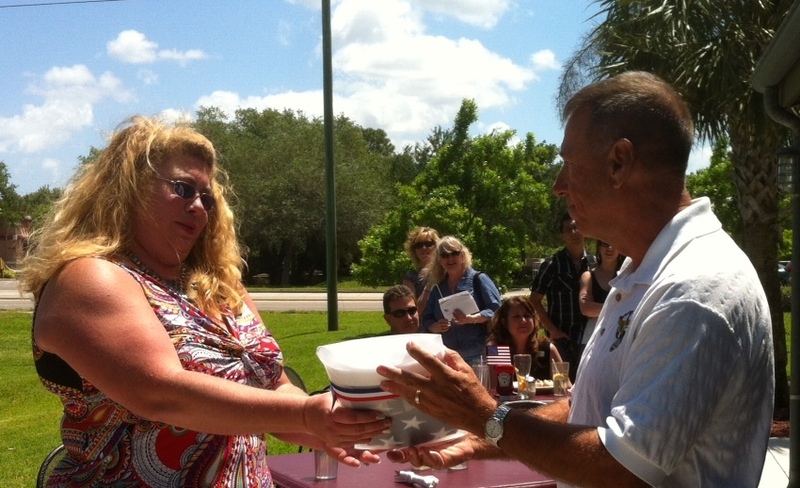 Thank you for all who joined in our prelaunch of "Catch The Cause" and who became members! Good food, good fellowship and a good cause! A good time was had by all! This Event was the intro to a week long "Doughraiser" for Operation Safety 91. 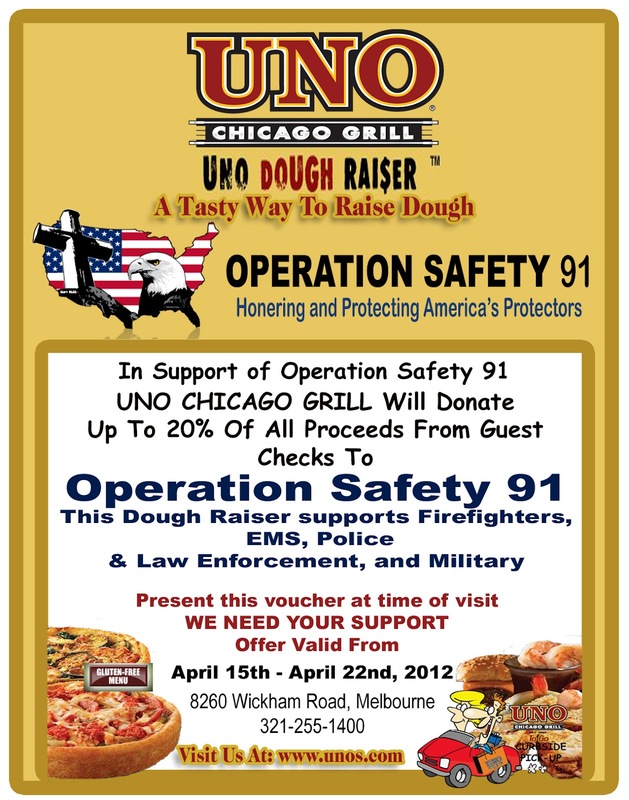 Present this voucher for dine-in, carry out, or commercial delivery this week 4/16 - 4/22 at the Melbourne UNO's, and UNO's will donate 20% of your check back to OS91 for Responders. The teaching on Leadership of OS91's National Spokesperson, COL Danny McKnight, US Army (Ret.) This is EXCELLENT! 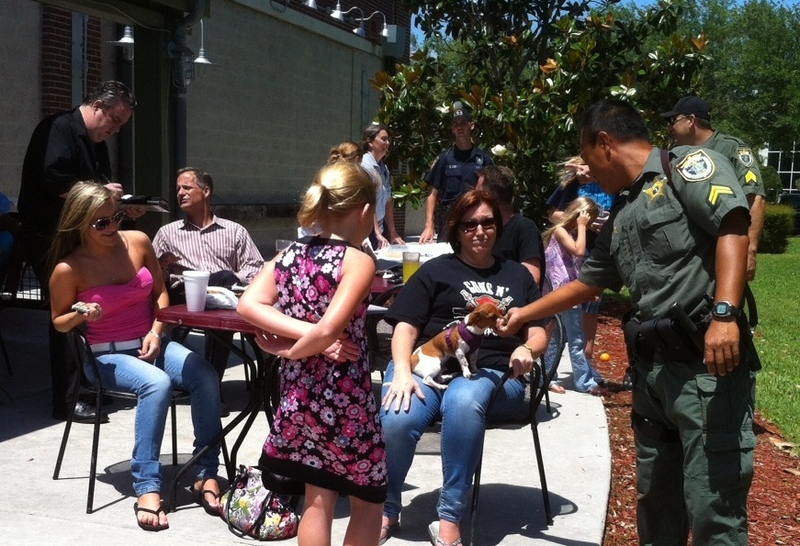 Operation Safety 91 (OS91) www.OS91.com invites you to a one hour (1 - 2 pm) Meet and Greet Responder Family Event this coming Sunday at the Melbourne UNO Chicago Grill East of I-95 across from the Brevard Zoo. This Event will be the prelaunch of Operation Safety 91's new campaign called "Catch The Cause" to spread our mission, to honor and protect Responders, across America through Community Events, education and social networking. 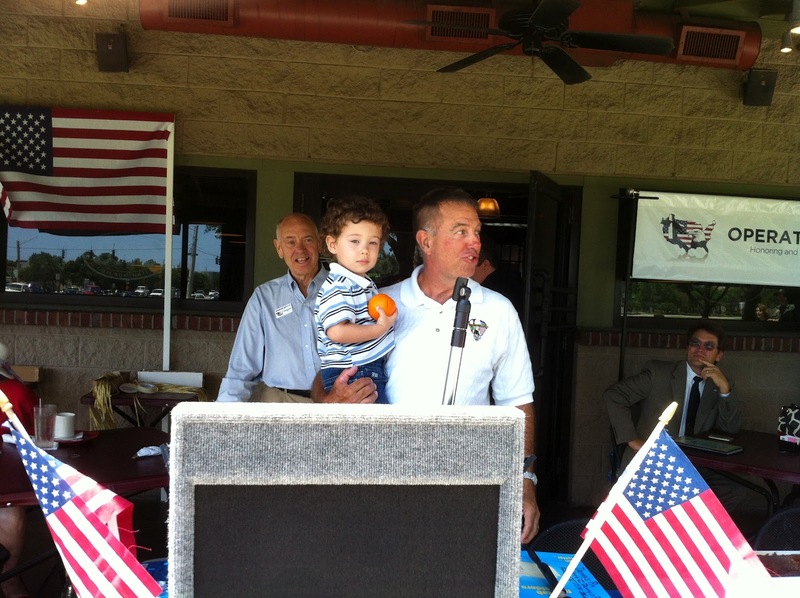 Our very special guest speaker will be OS91's National Spokesperson, COL Danny McKnight, United States Army (Ret.) 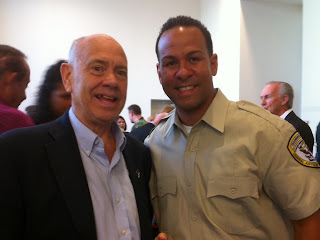 of "Black Hawk Down" renown. www.dannymcknight.com. 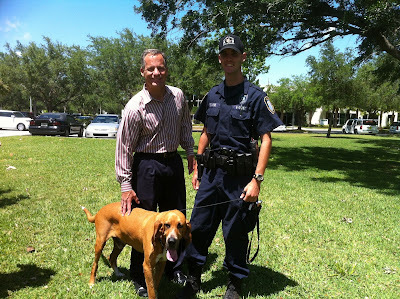 Bring your pet dog to join with other dogs to support Responder K9s! 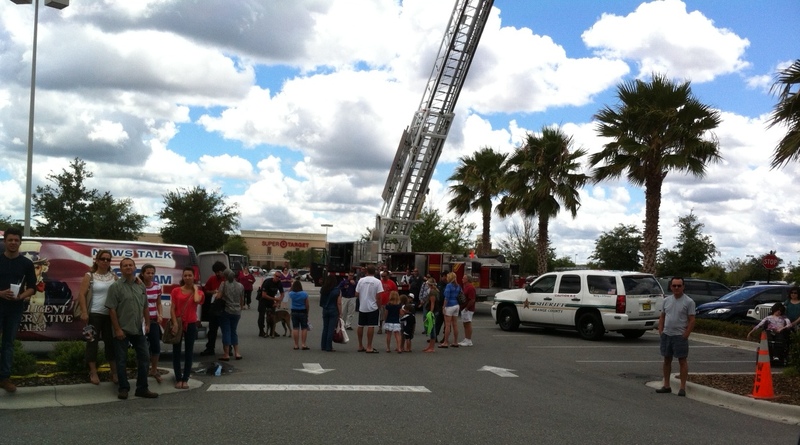 Present will be local Responders and their vehicles. 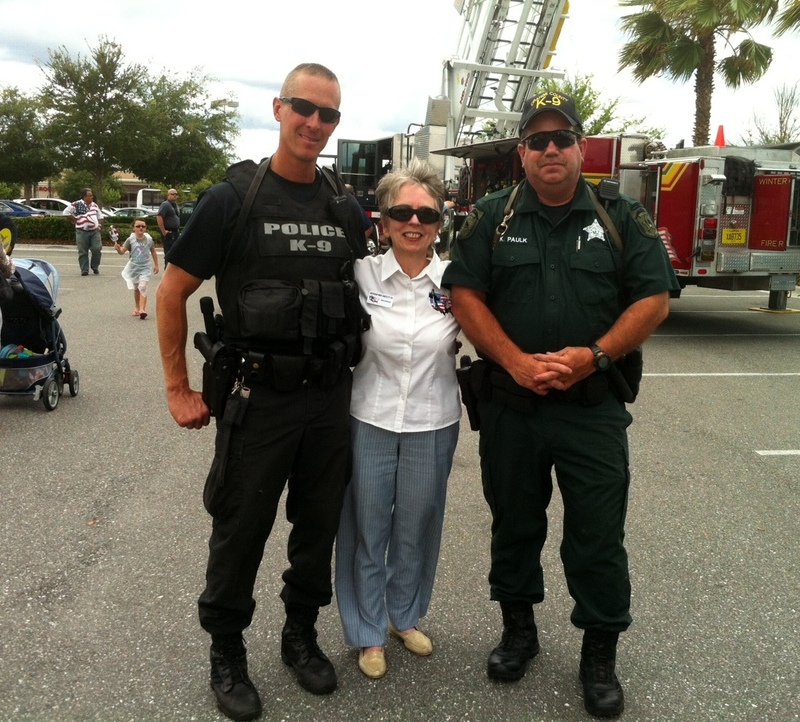 These are the Responders who protect, rescue and defend us daily at the risk of their own safety. 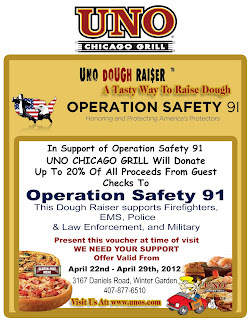 This Event begins a week long "Doughraiser" for Operation Safety 91. Download this voucher and present for dine-in, carry-out, or commercial delivery and eat for a great cause: to support our Responders at home and our Troops abroad. Tonight Operation Safety 91 was invited to attend the Criminal Justice Academy of Osceola Graduation of the Law Enforcement Officer Class of 2011-03 held at the beautiful St. Cloud High School Auditorium. Twenty three future Law Enforcement Officers that would inspire anyone! Several of the graduates are Military, two are Firefighters and every one to be commended. 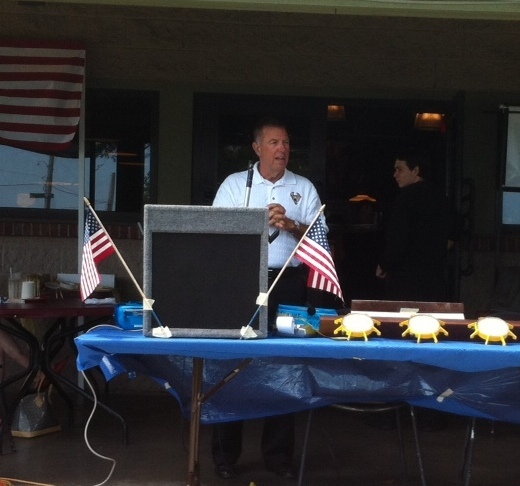 Many received rewards for various skills. 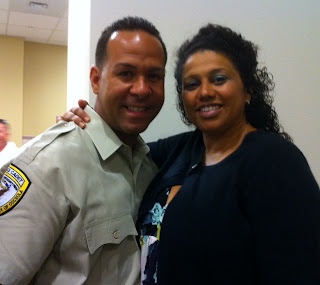 Thank you to James Pagan for inviting us to this Graduation. We are so proud of you, James! Our gift to this young Graduate is the book Your Shield and Buckler on Psalm 91 protection for Police written by LEO and LEO Chaplain Jorge Diaz, Founder of Officer of the Lord Ministries. http://www.officerofthelord.com/shieldandbuckler.htm. This is an excellent book with several testimonies of the miraculous protection of Psalm 91 for Police. 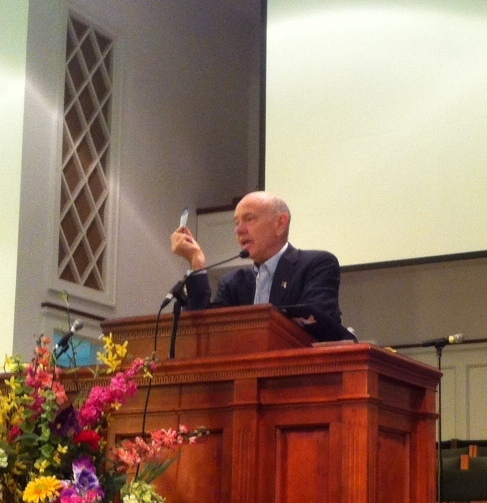 And, of course, we were able to give many of the graduates and the current class of Cadets the Psalm 91 card. Our heartfelt congratulations go to the Class of 2011-3 for the successful completion of their training. We pray for your continued success as you go forth to fulfill your mission of being, according to God's Word in Romans 13: 1- 7 "Ministers of God for good....who do not bear the sword in vain." 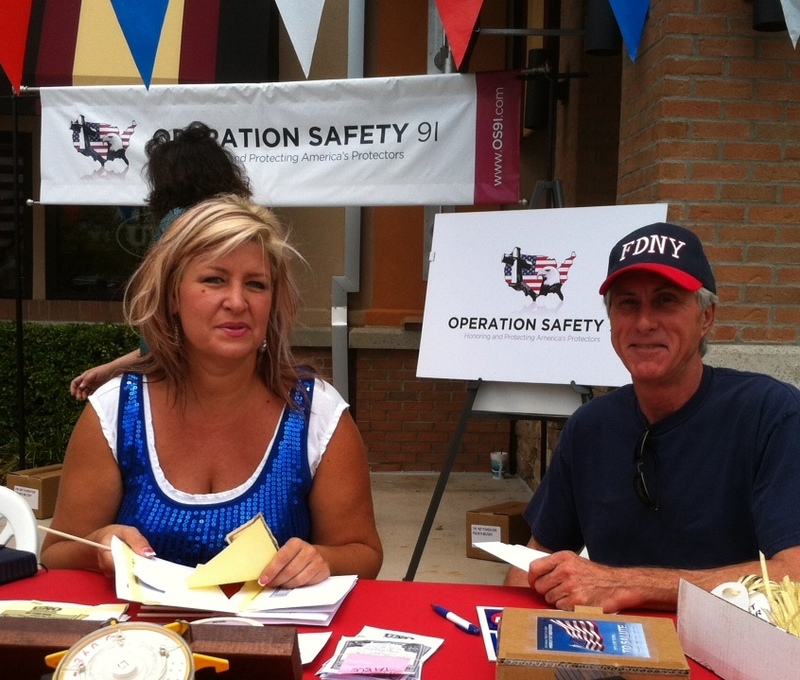 Know that Operation Safety 91 appreciates you and prays for you daily!